Prior to last winter, I never pictured myself as a homemade soup kind of gal; I pictured onions and carrots floating around a pot of water with a few flecks of dried parsley on top, as if I would be making soup for a poorhouse in Victorian England. But then I tried roasted vegetable soup, and my views were forever altered! 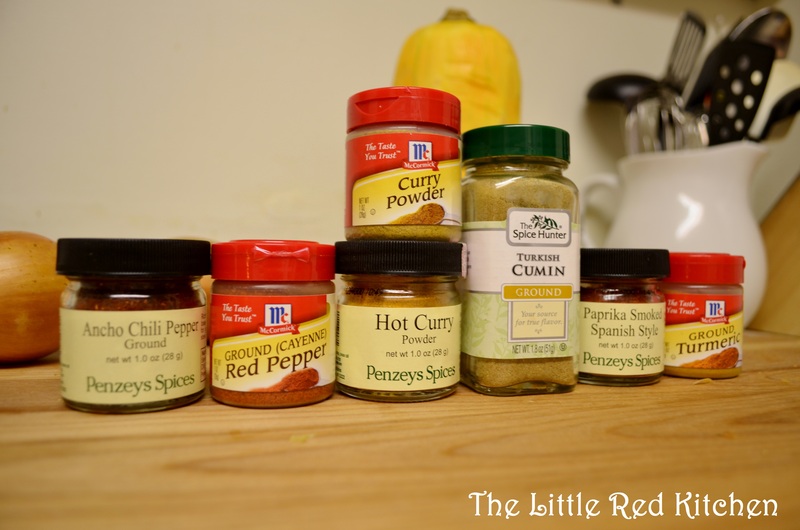 I just happened to select these today, but feel free to play around with the recipe! Note, this makes a ton of soup. It would serve at least 6, but it’s an excellent idea to freeze half of it too! Pre-heat your oven to 425 degrees, and make sure you have a rack in the upper middle position, and a rack in the lower middle position. Prepping all your veggies is step 1, that’s really the hardest work that goes into this soup. But boy is it hard with a butternut squash. After you are done sawing your way through the peel with a peeler, a paring knife, a cleaver, the jaws of life, etc., slice it into 1-inch disks, and then cut those disks up into about 1-inch pieces. 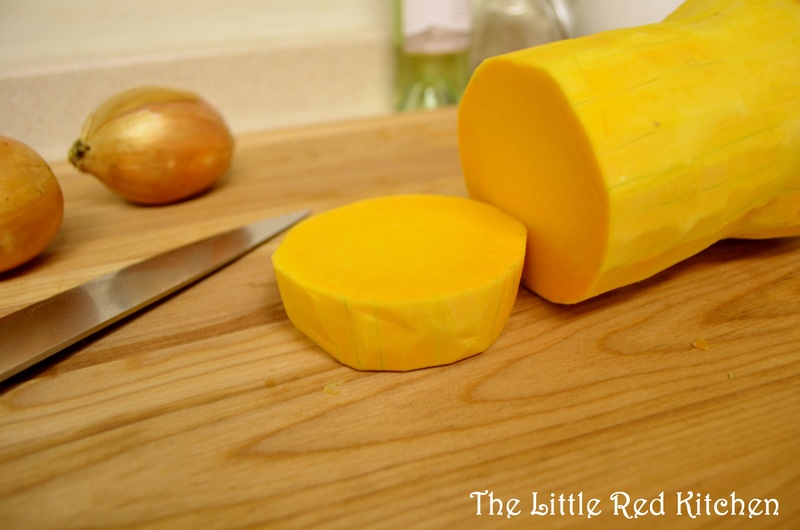 Once you get to the bulb of the squash, scoop out the seeds and sinewy bits, then slice into wedges and cut the wedges into 1-inch pieces as well. 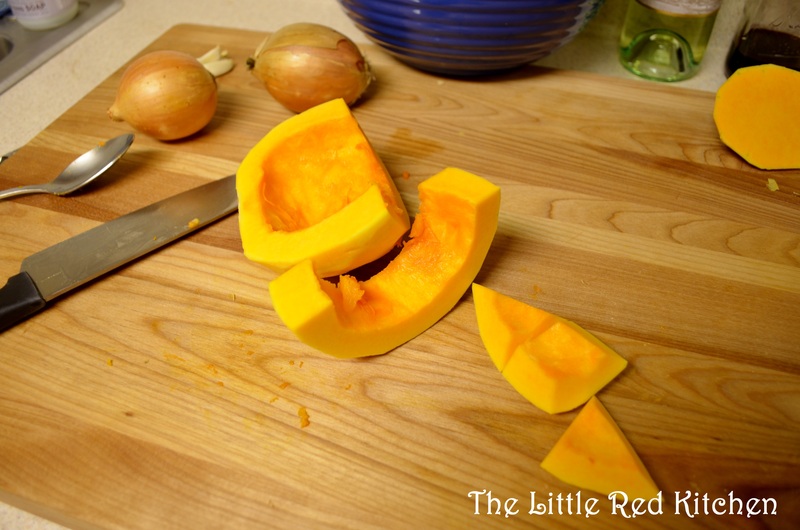 Throw the squash chunks into a large bowl as you go, then cut up the onions and put them in as well. Add all the spices, the salt and pepper, and the 3 tbsp. of oil, and toss to combine. 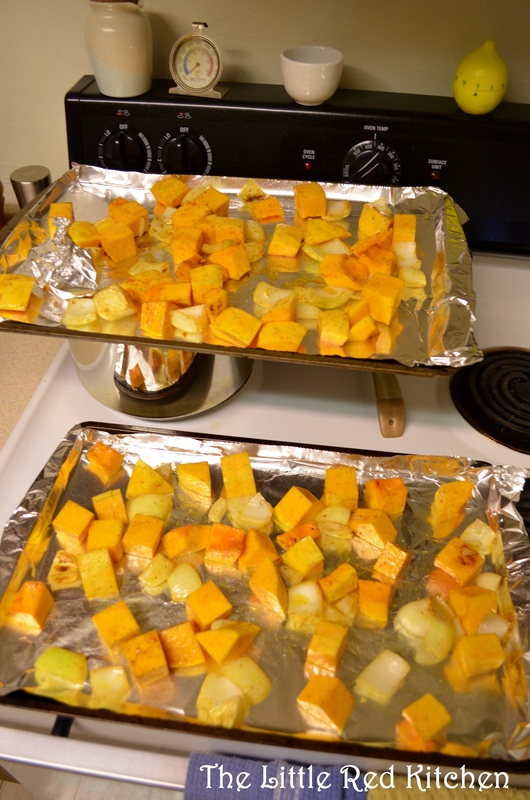 Divide the squash mixture evenly between 2 of your largest rimmed baking sheets that have been lined with aluminum foil. Then take the 4 garlic cloves and place them in the center of a small piece of foil, pour the tsp. of oil over them, and fold up the foil to create a little garlic pouch. Then you can just place this pouch on either of the baking sheets. Roasted garlic is unbelievable, but it will burn if it spends so long in the oven, that’s why we have to wrap it up separately. Avoid the temptation of just throwing it all on one baking sheet. Things won’t bake as evenly, you’ll have some pieces burning and some barely roasting at all, and most will just steam from the close quarters, and not really roast and caramelize. If you don’t think that above picture looks delicious…I just…I don’t know. You can have a can of condensed soup for lunch instead, no hard feelings at all. Oh also, when there are about 5 minutes left in baking time, pour all the stock and water into a small saucepan and just heat it over medium-low or even low. We just want to warm it up. Now comes the only other finicky part of the recipe besides the prep; the actual turning the vegetable chunks into soup. To make things easier, as you can see in the above pictures I combined all the veggies onto one tray and then set that tray up next to my blender. If you have a huge Ninja blender or something, a) I am jealous and b) you can process everything in 1-2 batches. But if you have just a regular ole’ Black & Decker like I have, this will take about 3 batches. That being said, it still took me less than 10 minutes from start to finish. It’s not an exact science, but put about 1/3 of the veggies into the blender and pour in about 1/3 of the stock and water from the stove. Puree until smooth. You may have to add a bit more broth, or maybe that amount I suggested is too much. It all depends on the veggies, and the blender. 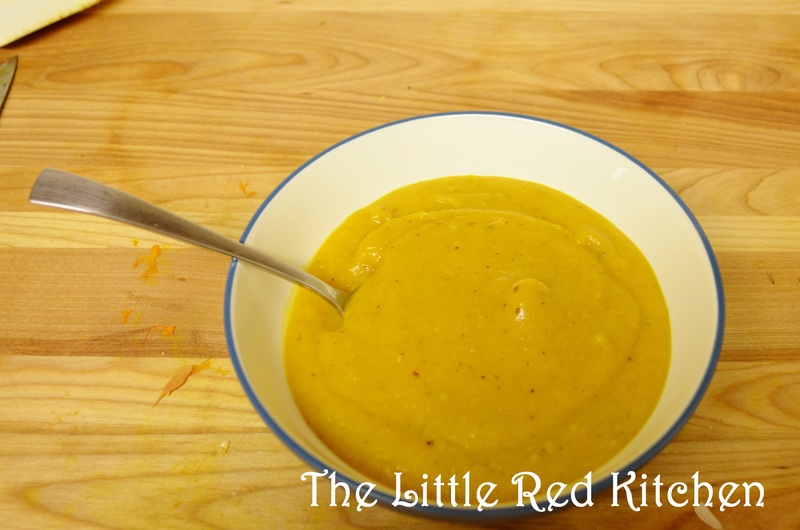 If the puree gets “stuck” while the blender is running but you can tell it’s not completely pureed through, then you know you need to add a splash of stock. Transfer each batch to a large pot as you go, and when you get to the last batch, don’t forget to add the roasted garlic!! The best for last, as the saying goes. Once it’s all into a pot, heat it over low, just to make sure it’s heated through. And here you can adjust the total consistency. If it seems too thick, just thin it out. I have honestly never run into a problem where it’s too thin and needs thickening. Even if you end up using all 4 cups of liquid (which I did) it should be perfect! This recipe is so versatile! 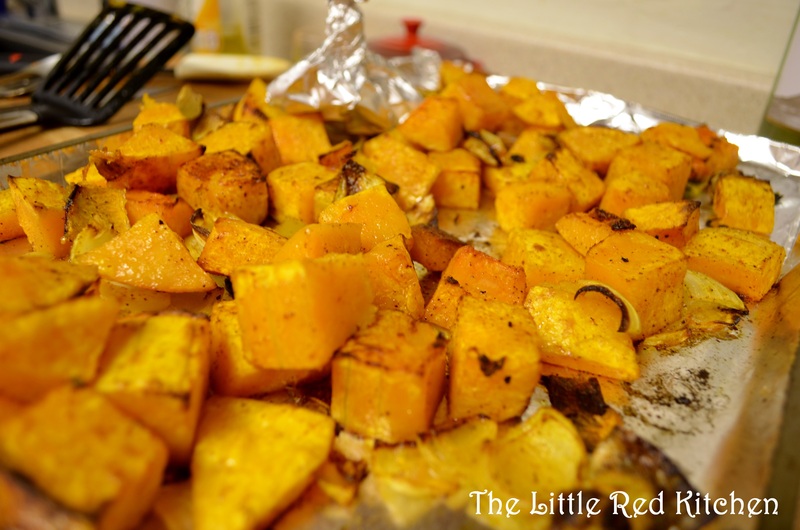 Throw in sweet potatoes and carrots too, or try parsnips and Yukon gold potatoes. 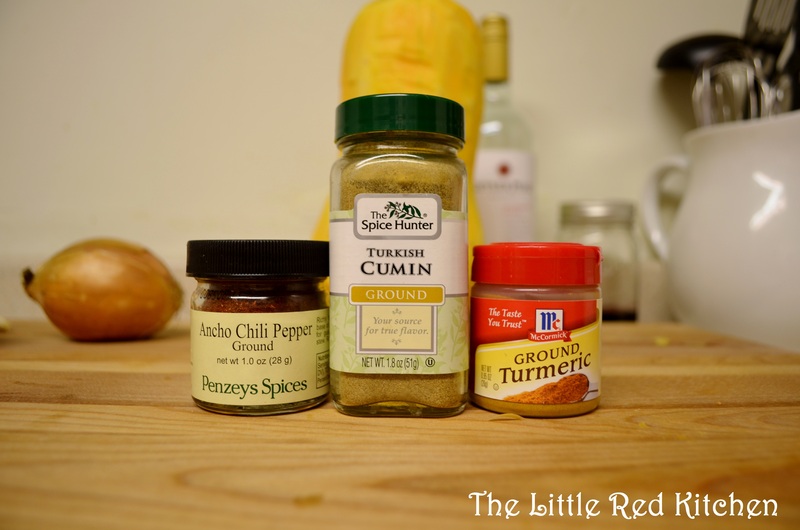 Switch up the spices, add fresh ginger, stir in a tbsp. or two of half and half to make more of a bisque. My favorite thing is to cook up giant homemade croutons on the stovetop while the soup cooks and to top it off with those. 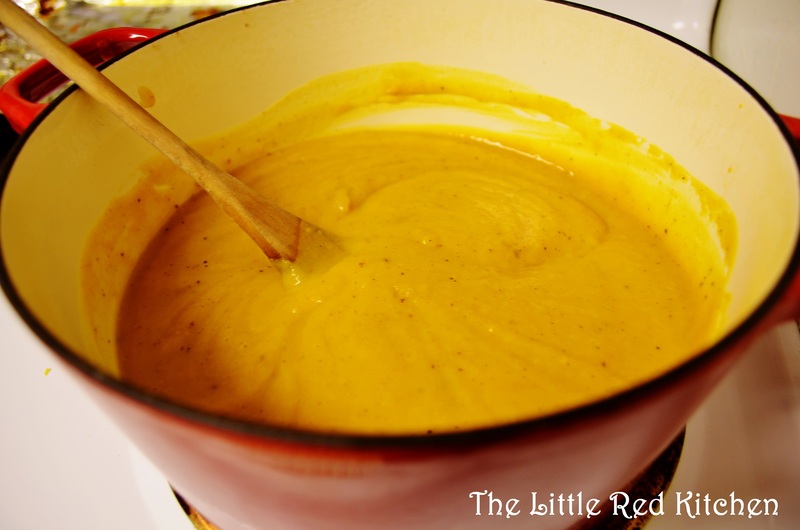 With so many options, this delicious and not to mention healthy soup will surely get you through the winter. 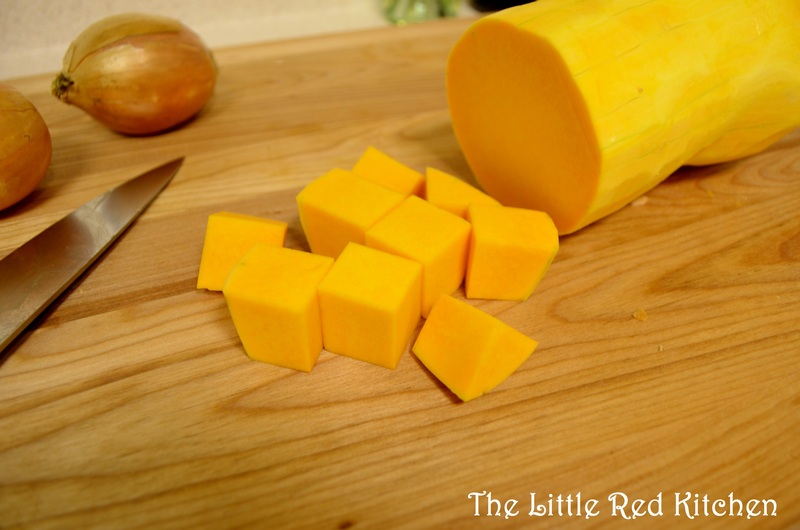 Trader Joe’s sells pre-cubed butternut squash. I’d definitely use that to save time + energy (because I’m lazy when it comes to cooking). Did you have to remove the garlic pouch from the oven before the other veggies were done? Or did the pouch allow you to leave the garlic in there for the full time?